In December 2002, the UN General Assembly, declared May 21 to be the World Day for Cultural Diversity for Dialogue and Development. The weakening of traditional ties between cultures and geographical location, and the rapid expansion of intermingling of cultures have placed greater importance, especially for national governments and the international community as a whole, to safeguard the manifestations of cultural diversity while recognizing the tangible and intangible opportunities offered by the co-existence and exchange of cultures and practices. As these are important pillars for sustainable development, integrating cultural diversity into development frameworks and policies are critical. Hence, the recognition of the United Nations in creating this day to celebrate these principles. This year, the event was celebrated on May 31st at the United Nations Headquarters in New York and co-hosted by the Permanent Missions of the Republic of Vanuatu, Colombia, the State of Qatar, the Republic of Senegal, and the Slovak Republic. Kota Alliance was thrilled to part of the conversation. There are still considerable challenges with our globalized world as evidenced by three-quarters of the world’s major conflicts having a cultural aspect. Civilizations, societies and cultures, like individuals, exist in relation to one another; therefore, bridging the gaps between cultures is urgent and necessary for peace, stability and development. Promoting intercultural dialogue to foster tolerance and understanding is an essential foundation to promote harmony and discover the features that are common within our humanity. Thus, dialogue to utilize our cultural diversity unites us all. The most relevant and touching statements were made by the Representatives to the UN of the following countries: Colombia, Hungary, Panama, Azerbaijan, Belize, Oman and from the Organization for Security and Co-operation in Europe (OSCE). Mr. Francisco A. Gonzalez, Deputy Permanent Representative of Colombia to the United Nations, talked about the disarmament time his country is currently living in and how important it is to give hope to younger generations who grew up during times of conflict. “This is a new chapter to grow and share that feeling [of hope] with our children”, Mr. Gonzalez said. Mrs. Katalin Annamaria Bogyay, Permanent Representative of Hungary to the United Nations, talked about using cultural diplomacy to promote trust among humans and break the barriers that divide us. She explained how this would encourage people to not be afraid of others who look different from them.She also mentioned how schools, libraries and the overall community i should teach children to be interested in others’ cultures as opposed to being afraid and discriminating . “Diversity should not be a burden to societies, but a source of inspiration to create a stronger, international and intercultural community”, Mrs. Bogyay manifested. Mr. Melitón A. Arrocha-Ruiz, Permanent Representative of Panama to the United Nations, talked about the recent law code created by his country to protect local culture in all facets (clothing, music, instruments, etc.) . He conveyed his belief that local culture must be protected in order to then share it regionally and internationally as well. “We strive for inclusiveness to further cooperation and collaboration among all people”, Mr. Arrocha-Ruiz expressed. Mr. Yashar Teymur oglu Aliyev, Permanent Representative of Azerbaijan to the United Nations, talked about how peace can, and should, be achieved via inter-religious and intercultural dialogue and exchange. “In order to build a peaceful environment for all people to live in, we need to accept and respect the religions and cultures of others using the exceptional tool of dialoguing,” expressed Mr. Teymur oglu Aliyev. Ms. Lois Michele Young, Permanent Representative of Belize to the United Nations, talked about how culture is a way of life, a way of living and expressing. “Culture should be treated and used as more than just dances and music, as it is what represent us in front of other cultures. This is how we see it in Belize”, said Ms. Young. Mr. Khalifa bin Ali Issa Al-Harthy, Permanent Representative of Oman to the United Nations, talked about how peace and prosperity should be achieved by all human beings. “In Oman, the government authorities encourage and promote tolerance and acceptance of others within the local society. A form of ‘Live and let live’ doctrine”, Mr. Ali Issa Al-Harthy expressed. Mr. Samuel Goda, Special Representative of OSCE, Chairmanship-in-Office on Youth and Security, highlighted that we are all one blood and therefore we are all equally human, without distinction and differences. “We should seek common welfare for all the humanity”, Mr. Goda emphasized. At the end of the event, the general consensus expressed by the event’s moderator, Mr. Odo Tevi, Permanent Representative of Vanuatu to the United Nations, was to never stop talking, learning, accepting, respecting and sharing our own culture and that of others in order to grow bigger and stronger as an international community of people who seek peace and understanding. This statement was highly accepted by all members of the event and received an enthusiastic round of applause. At Kota, we seek to carry out these principles by providing the conditions and support to other like-minded organizations that also look to advance and promote equality and prosperity for women, and thus all communities of the world. The Convention on the Elimination of All Forms of Discrimination Against Women (CEDAW) is a treaty adopted in 1979 by the UN General Assembly. Often referred to as the the international bill of rights for women, the treaty definitively establishes what counts as discrimination against women. CEDAW outlines the agenda for nations to completely end the discrimination against women. The United States, though being an early signatory of the treaty, never ratified CEDAW. This absence of action only aids in facilitating discrimination against women, with no overseeing bodies or international obligation to promote and enforce gender equality. CEDAW provides the basis for realizing women’s rights and their equal access to opportunities in public and political life. CEDAW is also the only human rights treaty that declaratively guarantees women’s reproductive rights. Countries that have adopted and ratified CEDAW are legally bound to enact and apply measures and demonstrate their compliance with CEDAW’s provisions to end discrimination against women. To circumvent the U.S’s lack of participation in CEDAW, individual cities are committing to CEDAW by writing local and municipal ordinances that follow its stipulations. In consigning themselves to CEDAW, cities create the foundation for a legal framework for equality that protects women’s rights. NYC4CEDAW will be hosting a Day of Action soon, when members are looking to pass a local ordinance that links New York City’s Commission on Gender Equality to CEDAW. Passing this bill obliges NYC to commit to funding and resources that support the implementation CEDAW principals. The original date which was announced for a rally been cancelled and a new date will be announced soon. 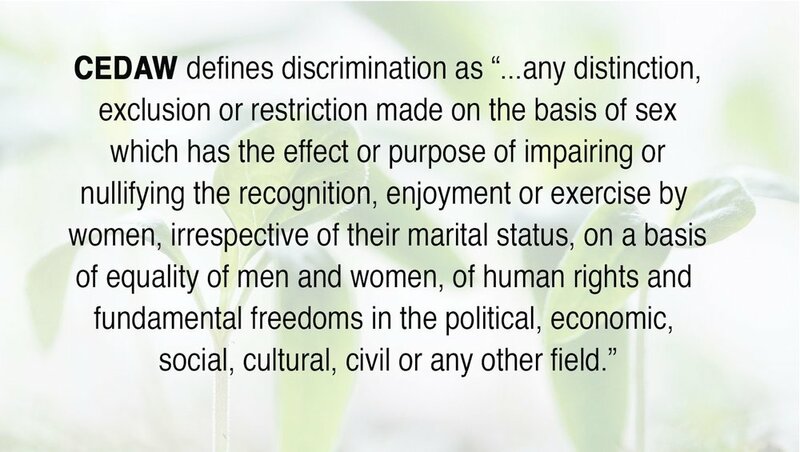 For more info on The Convention on the Elimination of All Forms of Discrimination Against Women check out the links below.